U.S. Army Men's Hoodie Just $16.99! Down From $60! Shipped! You are here: Home / Great Deals / U.S. Army Men’s Hoodie Just $16.99! Down From $60! Shipped! U.S. Army Men’s Hoodie Just $16.99! Down From $60! Shipped! For a limited time only! 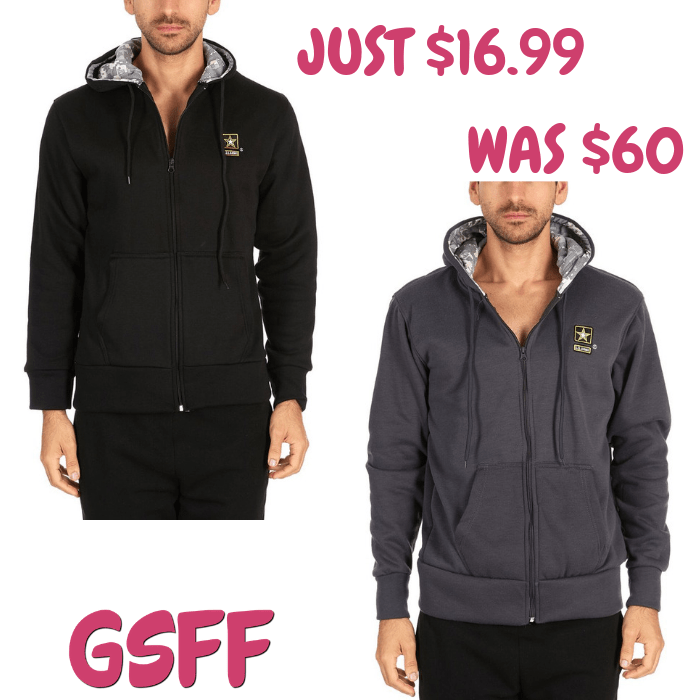 Proozy is offering this U.S. Army Men’s Hoodie for just $16.99 down from $59.99 PLUS FREE shipping! It doesn’t matter if you “never get cold!” You still need these U.S. Army Men’s Full Zip Hoodies to wear when the weather turns chilly. These Hoodies are just the garment you need to keep yourself comfortable. They have a slim hem and cuffs without the bulk. Plus, the paneled hood with a custom draw cord allows for a customized fit. The Dual kangaroo pockets will keep your hands toasty too. Don’t miss out on this sweet deal!